Syncing Nokia phones with Mac was not as easy as the iPhone syncing as Nokia and Mac were never made for each other earlier, until the latest plugins released by Nokia team for most of the Nokia phones are being helpful in syncing these Nokia mobiles with Mac OS laptops. First you need to have the iSync app in your Macbook, and you should have that closed. Don’t keep the app open. Go to this page and download the required plugin by selecting the Phone device model that you have. Install the downloaded Plugin package, and it will get added to the iSync app automatically. Then open the app and hit Sync Devices to see if there are any devices ready to be Synced. Next, you need to add the device by scanning for any devices that are found either through USB connection, or through bluetooth. The device found would be shown along with the type of connection, and you need to double click to open its syncing options. Click on the device (for example I did the Nokia N97 mini that I was syncing), and you will find a list of options. Synchronization of phone contacts, only the contact details or every other detail of the contacts, and merge all the data on the computer and the device. 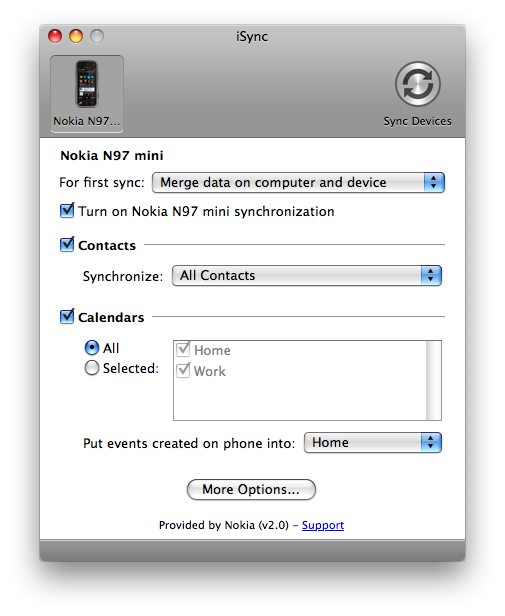 And many other options are available for syncing the Nokia mobile with a mac. Once you hit Sync in the top right area, the syncing begins and the contacts are matched, and details are displayed on how much changes can occur. You then have to decide on whether to sync the contacts or not. I wish it were so simple. Even after adding that plugin it tells me the N97 is not compatible with iSync?